Opening April 5, 2013, treat your family to the ultimate LEGO® experience – a day at LEGOLAND® California Resort and a night at the all-new LEGOLAND Hotel! 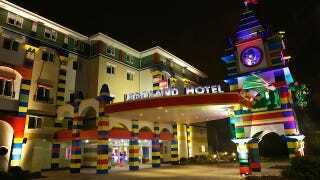 LEGOLAND Hotel will immerse your family in the creative world of LEGO®, for a truly unforgettable experience. From the moment you arrive at the spectacular dragon-guarded entrance, you'll be delighted by interactive LEGO features, themed play areas, family pool and kid's entertainment! Located right at the main entrance of LEGOLAND California, a stay at our new LEGO themed hotel will turn a day you'll always remember into a night you'll never forget! All 250 guest rooms are themed, so your family can choose from one of three popular LEGO lines – Pirate, Kingdom or Adventure. Rooms include two separate sleeping areas, with a queen-size bed for grown-ups, and a separate area for up to three little ones, complete with a bunk bed, pull-out trundle bed and their very own TV! A stay at LEGOLAND Hotel also gets your family exclusive early admission to LEGOLAND, as well as kid's entertainment every night! Each room also has a treasure hunt game inside, while the hotel itself will include the Bricks Family Restaurant, a Skyline bar (for mommy and daddy at the end of the day), a very convenient Lego gift shop, a heated swimming pool, and more. I'm kind of disappointed that Lego isn't using its licenses for some of the room themes (I'm sure it would cost some money, but if there were a Lego Avengers-themed room I'd book it and never leave). Here's my question: Do guests have to sign a waiver signing away their rights to sue if/when they step on a Lego brick in their hotel room in the middle of the night? Because you know its going to happen. It's a damn Lego hotel. It's going to happen in every single room every single night. Maybe all the guests will just get complimentary slippers with extremely thick soles.